Never before has one pair of cans offered so much. It’s as if the designers of Parrot’s new Zik 3 headphones decided to see just how many things they could pack into its slender frame. Adaptive noise cancelling? You got it. Bluetooth? Sure. Touch control? Why the hell not. Individual artist EQ? Accelerometer? Concert hall simulator? Smartwatch control? Yes, yes, and yes. Frankly, if we came into the kitchen in the morning to find the Zik 3s rustling us up a full English breakfast, we’d only be mildly surprised. This is a landmark pair of headphones, and although they have their own flaws and quirks, they represent a genuinely special piece of engineering that we had a total blast using. 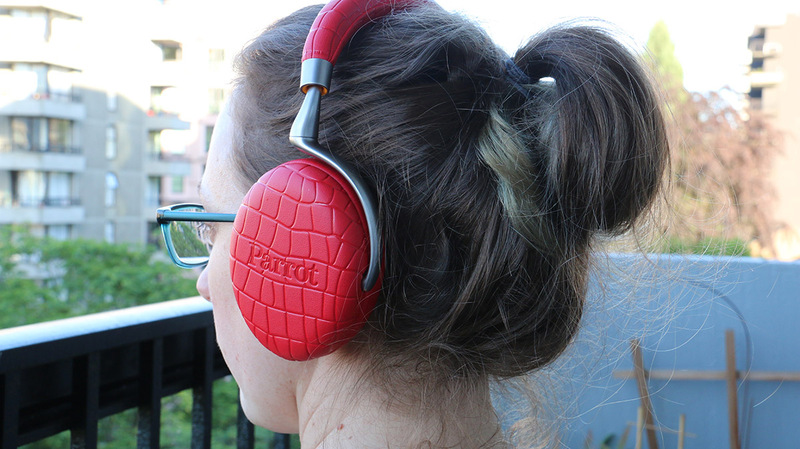 There’s no question that the Zik 3 headphones are a luxury item. At just under $400, it would be surprising if these things weren’t made of leather and metal and designed, somewhat inevitably, by Phillipe Starck. The swooping frame and muted design accents are a pleasure to look at, and the leather ear cups and headband come in a variety of colours. Ours came in a rather startling shade of lipstick red on an alligator-skin pattern - although if that isn’t your thing, there are plenty of options available. The headphones are immensely comfortable to wear for long periods, and at under ten ounces, we hardly noticed they were still there. Pairing via Bluetooth is the work of moments. Once the headphones are fully charged, a single press of a button on the back edge of the right earcup turns them on, and simultaneously activates the adaptive noise cancelling. Which, by the way, is extraordinary. Rarely has a pair of headphones been so effective at blocking out unwanted noise. And here’s the really fun bit: you can use the app to turn the noise-cancelling microphones into a superpowered set of hearing aids. The first time we did this, we were standing at a busy intersection, and we were stunned to hear a conversation from the other side of the road in crystal-clear quality. The actual act of getting music to play is half the fun here. The right earcup conceals an invisible touchpad, which is used to control the play, pause, track skip and volume functions. Tap to pause or play, slide the finger forward or back to skip, up or down to change the volume. It’s a fun and intuitive way of doing things, and for the most part, it works extremely well. Unfortunately, the touchpad isn’t quite as large or accurate as we might have liked; while it’s easy enough when you’ve got the hang of it, it’s sometimes all too easy to pause when you meant to skip, which means you’re left in limbo for a few seconds while you assume the next track is busy loading. Still, it’s an ambitious feature, and one we got a real kick out of using. And by the way, you don’t have to tap the earcup to stop the music. Remember that accelerometer? Just pull the headphones off your ears, and the wonderful circuitry inside them will deduce that you wish to stop listening to music, and pause it automatically. We listen to a hell of a lot of headphones for this site, but this one seemed genuinely attuned to our needs, aware of what we wanted and eager to pull it off. Bluetooth headphones are generally easier and more convenient than wired models, but this is just ridiculous. In a really good way. Like the touch control, Parrot’s bespoke app (Android and iOS) takes a little bit of getting used to. It’s not that it’s difficult to use – far from it – just that the options aren’t always where you’d expect them to be, and so it requires a minute or two with the app to get the hang of it. The app offers a huge variety of ways to control the sound, and this, we’re afraid, is where the headphones start to show their weaknesses. The main weakness is the sound. When a pair of headphones costs $400, it’s reasonably assumed that the audio quality will match the pricetag, that it will have a little something extra that separates it from the pack. And the Zik 3s just…don’t. It’s not that the sound is bad, it’s just that it’s flat, with no real character or life to it. If it weren’t for the amazing feature set and slick design, we could be listening to a pair of Audio-Technica ATH-M50Xs. Nothing wrong with that, as they’re perfectly good headphones, it’s just that we expected more. Bluetooth streaming affects audio quality by its very nature - it’s a feature, not a bug - but it still felt lacklustre. (For the record: call quality was terrific, and we had absolutely no problem picking up everything the other person was saying). It’s possible that Parrot meant it to be this way, or are at least aware of it. They include a huge range of options for controlling the sound, ranging from an unusual EQ to a concert hall effect to a set of artist presets (more on these in a moment). The problem is, while they certainly change the audio, it’s actually quite hard to get it sounding really good. The concert hall effect, in particular, just doesn’t seem to make sense. While there’s nothing wrong with a little bit of reverb and stereo positioning, there doesn’t seem to be much point in listening to a studio-recorded stereo file as played in a concert hall. It’s interesting, but it can get tiresome quickly. What is more interesting is how Parrot have tapped some high profile artists to create individualised presets that you can activate while listening to their music. Swiping right on the app will reveal a short list of artists like La Roux, DJ Jazzy Jeff, Rone and Max Richter, and you can also access various user-created presets from around the world. While it’s pretty awesome listening to an album like The Magnificent with an audio preset designed by Jazzy Jeff himself, there just aren’t enough artists doing it right now. Once Parrot gets buy-in from a wider range of musicians, this could be a terrific, groundbreaking feature. Right now though? It’s got limited use. The app doesn’t stop there. You can use it to turn flight mode on and off (the headphones offer a wired mode to save battery if necessary), name your headphones, adjust text-to-speech settings, shop directly for spare parts from the Parrot online store, and, somewhat bizarrely, display a map indicating the noisiest places on earth. We still haven’t quite figured out what this is for. Maybe Parrot is throwing down a challenge. Fortunately, the issues and quirks with the sound aren’t nearly enough to derail the whole train. A great-sounding, compact pair of headphones that really up the ante in terms of sound quality. If audio is super-important to you, and you couldn’t be bothered about things like touch controls, then these are the cans for you. This is what you go for if you need very long battery life, as well as pinpoint-precise noise canceling. Sound isn’t as good as the Parrot or Sennheiser, and is more suited to classical or opera than thumping dubstep, but they’re still a classy little number.